Lynch in Impressions: A Journey Behind the Scenes of Twin Peaks repeatedly refers to 'the purple room' as the Mansion Room. Could this mean the room is part of the Fireman's mansion, which in turn is referred to by Peter Deming and Dean Hurley as the 'Home by the ea? They do have the purple sea in common. Or do you consider it a separate place? Is the DVD out now? If I remember correctly, in Part 8 the purple sea is crossed to get to the Fireman's mansion (it was in black & white, but I assume it's the same sea). So I thought they were at least a part of the same complex or in the same area, if nothing else. I've always felt there was a lot of Jung to Lynch's perspectives. I remember reading in an interview with Mark Frost recently that he's the big Jung fan and Lynch is not. 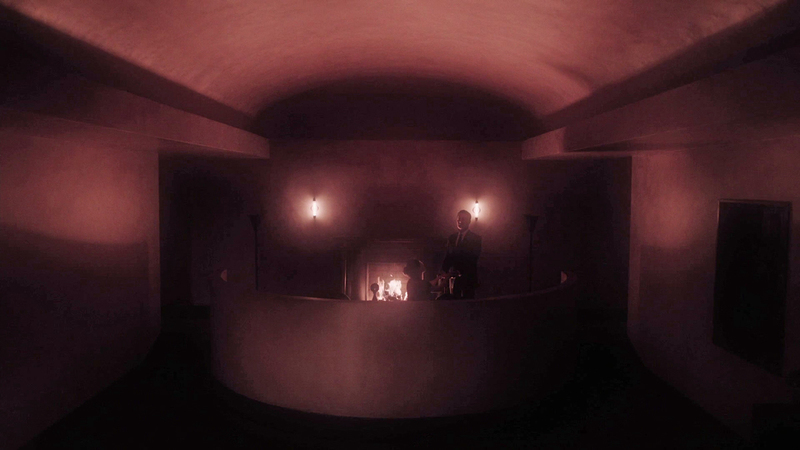 But I could see how some Jungian theory and symbology could slip into Lynch's work unconciously. Wasn't Jung interested in eastern religions/spirituality too? "...the Garbhodaka Ocean, which covers half the universe. The other half is the spherical dome within which the innumerable planetary systems exist." "The great sage Śukadeva Gosvāmī answered: All the hellish planets are situated in the intermediate space between the three worlds and the Garbhodaka Ocean...As previously explained, below our planetary system are seven lower planetary systems, the lowest of which is called Pātālaloka. Beneath Pātālaloka are other planets, known as Narakaloka, or the hellish planets. At the bottom of the universe lies the Garbhodaka Ocean. Therefore the hellish planets lie between Pātālaloka and the Garbhodaka Ocean." If not a direct representation, is the purple sea Lynch's own version of the Garbhodaka Ocean? "But I could see how some Jungian theory and symbology could slip into Lynch's work unconciously...."
It is kind of interesting either way, isn't it? Maybe more so to explore this idea that it is part of the same place. With the help of MoMA's sound system, I distinctly heard what sounded very much like the klaxon/alarm sound from Part 8 during the scene in the Mansion Room in Part 3 tonight. Perhaps these events are occurring at the "same time?" Which part of episode 3? I think it is when he is interacting with Naido, but it could be the part with American Girl. As I said, it wasn't something I heard at home; only in the theater. I haven't gone back to see if I can hear it at home now that I know to listen for it, but if I do I will let you know.